When you think of the “collaborative economy,” chances are, you picture people sharing their cars, homes, and money. But that’s not the only thing people are sharing. Now, more and more people are sharing their time. They’re sharing their time to do small projects like deliveries, or they’re helping other businesses online as contractors, or using their time to create physical goods in the maker movement. The result is this: The crowd is becoming like a company — and enterprising marketers are learning to take advantage of this trend. At the moment, new startups enabling peer-to-peer transactions are impacting over 12 industries — and their impact will continue to impact more verticals. 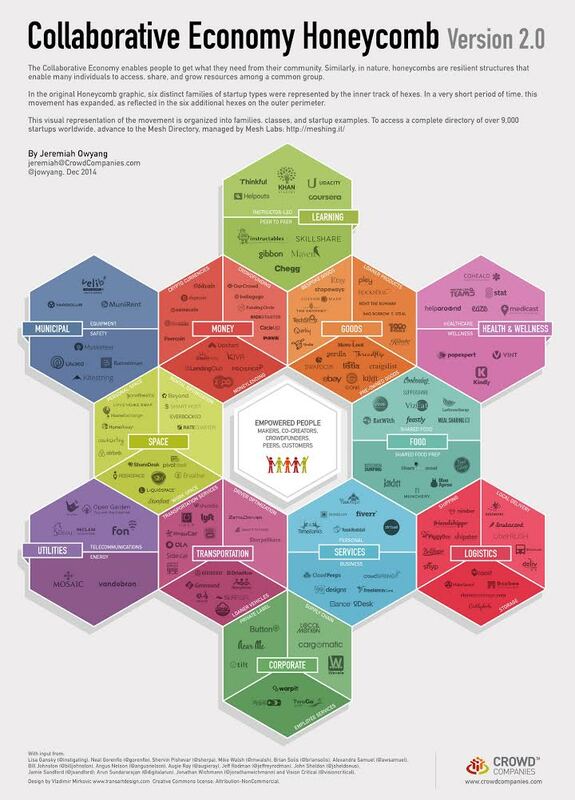 To visualize just how massive the collaborative economy is, we have created the infographic below. Your company could sponsor marketplaces of makers, like Shapeways, CustomMade, or Etsy to try to extend your brand’s promise. Your company could lead crowdfunding campaigns. For example, Honda partnered with Indiegogo and communities to save local drive-in theatres. Cloudpeeps offers on-demand community managers, which can help scale up your own customer relations through social channels. You could use WoNoLo to enable customers to stock your shelves for a fee. There’s even The Storefront, an Airbnb for retailers where you can list or use excess space in a retail store. For more inspirations on business models and marketing ideas, see this large timeline of brand deployments in this market. It should help to spur new ideas and innovation for your company. The collaborative economy is growing. It disrupts traditional business models, but it also provides marketers with a whole new range of resources that can enable them in their work. To learn more, read my entire body of work on the collaborative economy available on this page.